Yes, True. But not everyone makes a lemonade because they are smart/brave. For many, there is no other option! People who know me, already know this: Most of my problems are self-inflicted. When I chose to become a ‘Professional Blogger’ before around six years, I had no idea what I was getting into. I thought I had savings for 3 years, but I exhausted that money in less than 2 years. My blogging income was not sufficient, back then. It was a friend who suggested freelance writing to supplement my blog income and that was a life saver. If not for that, I wouldn’t have seen the day when the income from my blogs finally picked up. This is actually not a big deal when compared to the houses and cars that my batch-mates and former colleagues routinely buy. But when you consider the challenge I was up against to achieve even this, I guess it’s not that bad an achievement. I hope one day I will be able to create immense value to the society. Online publishing is the path I chose for it. So far, if not happy, at least I am satisfied with my journey. And I have seen some success. I hope God shows me the best path forward, in the future too. This doesn’t mean that I advocate alternate/unconventional careers for everyone. What I am doing suits my personality and was the best thing to do given my circumstances. Each person is unique and they should decide for themselves. Every career has its advantages and limitations. I have a blog friend from Malaysia who took freelance as his full-time job and have thrived in life to look after him and others. I see the same spirit in you and you’re the first person I know converting blogging into profession. No matter what, what we bought from own saving and hard work is worth and should not be compared. I like your decision to go forward with courage to meet what come ahead. Yes, the bike looks short but since I am not that tall, it is fine for my height. Congratulations on getting a new bike. Your life story is very inspiring. Best wishes for you to win this contest. I think those tough paths are deliberately sent in our way so that we can find our objective. 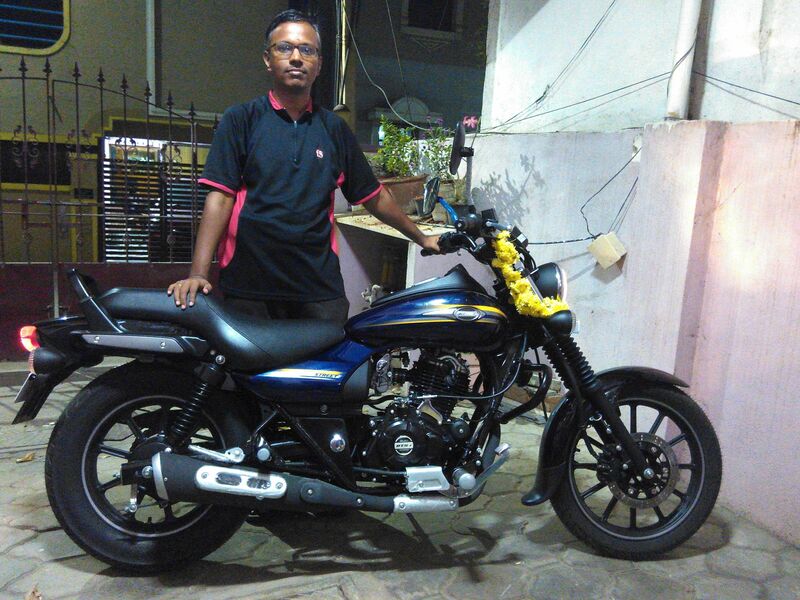 Congratulations for the bike and for putting the feet forward. Do what you like most Rajesh! Though it might take some time, you will come out well! All the best! WOWO first of all that bike looks marvellous… in my time we only had a couple of makes enfield or the rajdoot..
Congrats for the new bike! I didn’t know that you have made blogging your profession. I thought you had a day job also. That’s great DI that you have been able to fund all your expenses by making writing as a profession. You are inspiring!